Military veterans are welcome at all NSCD programs. Below are programs specifically designed for veterans or programs that have special pricing for veterans. Participants must be independent and manage self-care or bring a care-giver to provide assistance. During the Archery Clinic, athletes will be introduced to and taught the finer points of the sport of target archery. The NSCD will provide re-curve and compound bows that will be appropriate for athletes of all ages, levels and abilities. If you have your own archery gear please feel free to bring that for personal use. You will receive instruction from a USA Archery Level II instructor who is well versed in the new and traditional forms of archery and how to achieve success in each style. 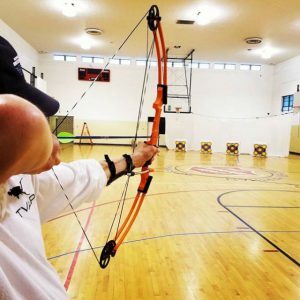 Whether you are a new archer or an old pro looking for some feedback and a range to practice on, this program is a great fit for you. The NSCD partners with the Denver Police Department and Craig Hospital to offer an adaptive airgun training program. The program began with a grant from Adaptive Sports USA to bring adaptive air rifle skills and competitions to veterans in seven cities across the United States. Joined by Paralympic Coach Roger Sak, the military veterans joined a national community-based outreach program, providing resources and education, conducting regional and national competitions and providing access to international competitions. The Denver Adaptive Airgun Team (DAAT)’s success has enabled the program to continue, and it is now open to anyone with a disability and free to military veterans. DAAT is an air rifle and air pistol shooting program for participants of all abilities. DAAT is a great chance to try the sport of airgun as well as an opportunity for established marksmen to hone their skills and share shooting experience/expertise with their peers. *The following video contains military footage with gunfire and explosions. 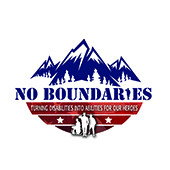 The No Boundaries program promotes self-esteem, pride and a sense of accomplishment for combat-wounded service men and women as they expand their independence and overcome challenges once thought insurmountable. 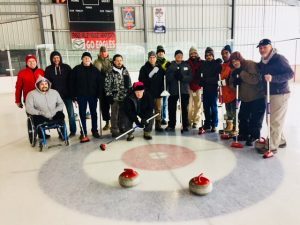 Our wounded veterans do this by experiencing a variety of challenging activities at the National Sports Center for the Disabled (NSCD) in Winter Park, Colorado. 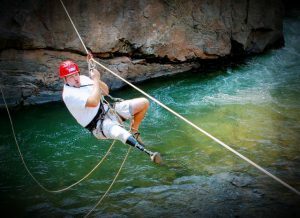 The challenges and accomplishments on these trips help wounded veterans understand that their disabilities may not be as limiting as they once thought when participating in many of life’s available activities. Living together under one roof for six days, these heroes also benefit from group socialization, camaraderie, teamwork and new life-long friendships with fellow veterans who are in the same situation and experience the same challenges in life. The No Boundaries program is fully sponsored by caring and appreciative supporters, friends, missions and Federal Information Technology (IT) organizations – all who want to “give back.” No Boundaries has its own account at the NSCD, a 501(c)3 non-profit. There are no salaries or overhead and 100% of each donation goes to support the wounded veterans on these trips. Our goal is to sponsor one summer trip and one winter trip for 10 veterans each year. 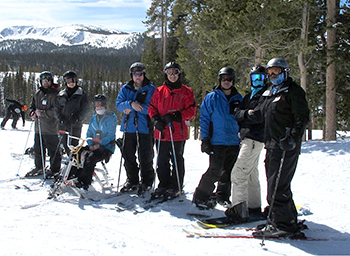 The NSCD has a specially trained staff and the facilities to host and accommodate 10 combat-wounded veterans in Winter Park, CO. Each six-day trip is full of challenging and exciting summer or winter activities. Typical sports activities in the summer include rafting, zip lining, ropes courses, kayaking, rock climbing, downhill mountain biking and fly fishing. Winter trips include adaptive skiing, snowmobiling and tubing. All adaptive sporting activities at the NSCD are tailored specifically for the veteran’s needs and are supervised by trained staff. Participants depart from their local airports and arrive at Denver International Airport where we rendezvous in the USO-Metro Lounge. All meals, lodging, transportation and daily program activities are coordinated by the NSCD and are included – expense-free – for the combat-wounded veterans. Email Mike and Molly Raymond for more information on the “No Boundaries” program. The NSCD is a 501(c)3 non-profit and provides tax-deductible receipts for all donations. To donate to the No Boundaries Program specifically, click here. After you enter your donation amount, check the box indicating “The above donation is in honor, memory, or support of someone” and type “No Boundaries Program Donation” in the box indicating “Leave a comment: optional”. Your generous donation is very much appreciated! equipment as needed. 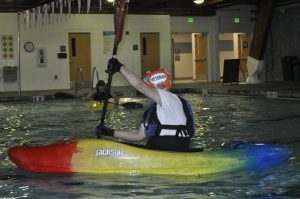 We invite all veterans to come out to the Carmody Recreation Center pool and improve their kayaking skills. During the Indoor Paddling Club, you will have the chance to learn and test your paddling skills in a fun and safe environment. Learn the basics or refine advanced paddling skills with instruction from certified and experienced instructors. This program is a great fit for both the veteran boater looking to stay sharp in the off-season or a novice wanting to learn the basics so they can hit the river when the season comes. 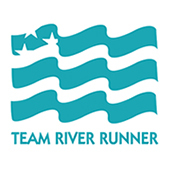 Join the NSCD and Team River Runner at the Carmody Recreation Center every Monday night! 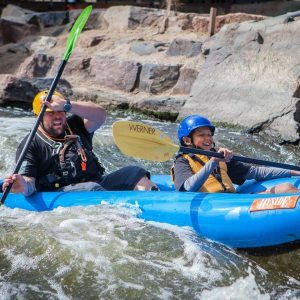 In our Outdoor Paddling Club, you will get the chance to explore a number of different whitewater parks in Colorado’s Front Range. 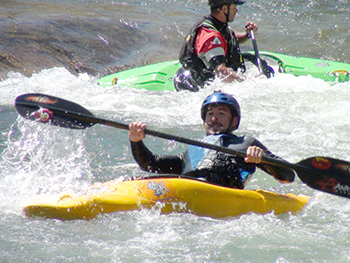 Practice your paddling skills or pass on your expertise in a fun and safe whitewater environment. Come prepared to challenge yourself and push your boundaries on the river. When paddling with the NSCD, you will be provided a boat, life jacket, spray skirt (if necessary), helmet and paddle to use for the day. If the weather warrants it, we will also provide a wetsuit and other protective equipment. We suggest that you try to avoid wearing jeans or sweats (anything cotton) and instead dress in layers of fleece, wool, Capilene or synthetic clothing. Weather conditions can change quickly on the water and it is better to have too many layers than to be wet and/or cold! *Location may change based on water conditions and level. Outdoor Paddling Club concluded for the 2018 season on July 26th, due to low water levels. In the meantime, we encourage you to check out our Indoor Paddling Club, which is year-round. We look forward to seeing you back out on the water with us in 2019! This activity is for military veterans of any age who have a disability and want to learn or improve ski or snowboard skills. Price: First lesson is free, subsequent lessons are 50% of published 2018-19 season pricing. Scholarships are available. Join us for four days of adventure camping in the mountains. Activities may include whitewater rafting, canoeing, kayaking, hiking, Winter Park resort activities and fishing. Space is limited – register today! Price: Free to military veterans with a disability. $25 deposit is required to reserve your spot and will be refunded at the end of camp. Join us for a weekend of tent camping at the Jim Creek Campground in Winter Park from Friday night to late Sunday afternoon. Your adventure may include activities ranging from rafting, lake fun, Winter Park Resort activities, NSCD Moves! and nightly campfires. Includes breakfast on Saturday and Sunday, lunch on Saturday and Sunday and dinner on Friday and Saturday. Take advantage of this opportunity to create lifelong family memories. * If the minimum number of campers is not met 7 days prior to a camp, the camp will be canceled. Join fellow military veterans with a diagnosis for a one-of-a-kind Paralympic experience that includes an introduction to curling, snowshoeing, cross-country skiing, Nordic biathlon and sled hockey. Price: Thanks to a generous grant for this program, there is no charge for veterans. If you are interested in receiving free transportation from a designated meeting place in Denver, please let the NSCD know when you make your reservation. Imagine connecting with other veterans who share your desire to get out and discover the freedom of the slopes. Join the NSCD for three nights of lodging, meals, two days of skiing or riding (including equipment rental, lift tickets and lessons) and evening activities. Transportation will be provided during the weekend between the lodge and resort. Free to qualifying veterans with disabilities. Price: Free to military veterans with a disability. Space is limited by the total number of participants and types of accessibility needs.